Fender Custom Shop's Roadshow LTD NOS series combines vintage with modern looks and features. Excuse the blurry pics, but I still wanted you to see the antique cherry burst color as well as neck tint. This Strat is both sweet and sporty. An LSR nut and heel relief are a nice nod to the Jeff Beck Strats. Also included are locking tuners, 2 point bridge, 22 fret mid-60's "C" (fat C) with 6105's and a 9.5" radius. Pickups are Abby wound 69's at neck & middle with an overwound Texas Special bridge. 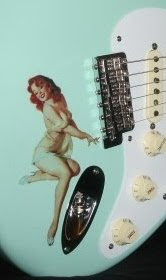 And if that weren't enough they threw in an S-1 switch-- which is probably gilding the lilly, but at least it doesn't have an EC preamp, EMG's or a Floyd. I'd say it's sportin' enough for most trad Strat players who still likes them a little trim on the side to feel young again. Sure! Music Gallery Inc Chicago based dealer since '74 and a spotless eBay Store history, have a nice FCS inventory including some Masterbuilt stuff as well as those new PRO NOS Strats with the fat headstocks and crazy colors. CURRENT LISTINGS - Top Sellers - Boutique Lines!